Nothing is so problematic about knife throwing as targets. Knives and axes rip up just about anything they are thrown at. They damage targets whether they stick in them or not. When a knife sticks in a target it makes a hole. Depending on the shape of their point, some knives make bigger holes than others. Big or small, eventually, two holes overlap, and then again, and this begins the process of cutting up the wood. A knife does even more target damage when it fails to stick, but instead, when it JUST misses. On many throws that are just a little too far or a little too close to the target, the point penetrates the target material, but the handle has gone too far over, or not far enough to stick. Instead, the handle of the knife is slammed flat against the target, and the point comes out of the material, gouging out a considerable chunk of it. For this reason, one wants the target material to be easily and inexpensively replaceable. There might be a few knife throwers in the world who have vast room indoors and can construct an outdoor style throwing range. Most of the time, throwing indoors means restricting oneself to smaller knives and targets that don't shred all over the carpet. There is also the matter of the knife bouncing off of hard target material and denting the walls or wooden floor. None of the indoor targets suggested below suffer from these problems. A 10 x 10 room has a 14 foot diagonal from one corner to another. A 4 x 4 target hung from the ceiling in the corner of the room will stick out from the corner by a couple of feet. Given the need for space to swing your arm and stance, such a room limits throws to about 9 feet, but that's more then a half turn for most knives, or a full turn with a pinch hold (see Holds & Throws chapter) with a little extra wrist. For some people this may not be enough to make the sport interesting. If indoor throwing is all you have, then perhaps some other sport would be more satisfying. As an adjunct to outdoor throwing however, an indoor target can be of great value, perhaps an off-season exercise, or a way to hone the eye/hand for fine accuracy, etc. If you are lucky enough to have a 12 x 12 room, you would have a 17 foot diagonal, room for a 12 foot range, enough for full turns of small to medium sized knives. Cardboard is the most commonly seen indoor target material. Use the corrogated cardboard one finds commonly in super-market boxes, and all kinds of shipping cartons. Generally speaking, the bigger and thicker they are the better, but remember you have to stand it up or hang it so over-all size and weight might grow too large to be practical. Flatten the boxes, and pile one atop another like a stack of pancakes. Put enough together to make a 4 inch pile (at least). Measure it with you kneeling on top of the pile to press it together. Tape the whole thing together with duct tape. You need go around only in the direction that will be the vertical one when the flattened pile is standing or hanging. Now draw a target in the middle of it, step back, and have at it. You will notice after you stick a few dozen that the cardboard begins to tear and pull in the places most often hit. Chunks start flapping like doors on hinges, and knives bounce off once in a while, even when they strike point first. You can turn it over and use the other side too, but the back side will deteriorate even faster then the front since several layers of material will have been demolished already. So you start throwing more at the corners or other parts of your target, but eventually, it gets used up and must be replaced. I have discovered the following variation that helps with this problem. Make the carboard target as above, including the taping. 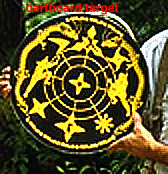 Now make another target like the first, only about 1 inches deep, and then hang it, with more tape, to the first 4 inch wide target. Paint your bulls eye and throw, notice what happens... As the top inch of your target get chewed up, the knives begin to penetrate the lower 4 inches, but only a little bit, and only in nice neat holes, because the upper inch absorbs most of the cutting and tearing. After a while, you take the top inch off the target (remember it is hung separately) and you will find the lower 4 still perfectly useable. In this way, you only need replace the top inch every couple of hundred throws (or more if the target was large and had a lot of room on it to begin with). The lower 4 inches will last through 6 or more such cycles before it has to be turned over. One of the best cardboard target materials I have found is the boxes used to ship personal computers and large office devices like printers, fax machines, etc. If you're not working for such a place, call around. Chances are there's some company within 25 miles that is upgrading and has lots of computer boxes to get rid of. Otherwise, supermarkets are a good source of material, but these make smaller targets usually. That may be all you have room to set up anyway, but the larger boxes can also be cut down to fit any size requirements. One thing to note with cardboard is that you are pretty much limited to the smaller (6 - 7.5 inch) knives. Larger knives begin to break it up so quickly, or actually penetrate (if they are sharp or heavy) 6 inches or more in one or just a few strikes, that it becomes impractical as a target material. One other possibility for an indoor target is celophane. It can be found rolled into spools three feet across which are then cut into sections maybe 6 inches thick. You will find this stuff at archery supply outlets. A section can be mounted on a wooden support, or hung from the ceiling etc. When a knife strikes the celophane spool it penetrates and pushes the celophane aside much as it does the grain in a wooden beam. The near misses described above do little damage as the celophane will stretch as it is pulled. Some will break, and over time, some will become cut and fall out in small pieces, but a single target should last many months. The material also absorbs missed hits. Slaps that would cause the blade to bounce just drop to the floor. Of course it is possible to throw past the target, so something should be hung on the walls behind it. This last consideration is especially important when one consider another of celophane's advantages. Unlike cardboard, it will survive faily large knives. 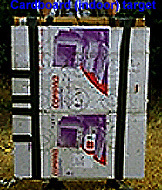 Other suggestions for indoor targets include phone books pressed together with clamps. One throws at the edges of the books so the knives can penetrate between the pages. I have not tried this idea, but it sounds good. It is probably impractical to hang a thick collection of phone books on the wall, but if you have something convenient to mount them on, it would probably work. Most knife throwing takes place outside. We assume that wood chips litering the ground is not a problem. Wood makes the best target primarily for aesthetic reasons. While there is an alternative (celophane described above), it does not make the characteristic sound of wood well struck. Wood is also more flexible in terms of the size and shape of the target. Wood of the sort required isn't always or everywhere available, and it may not be inexpensive. The traditional wooden target is a burl, a section of a tree trunk. Ideally, they should be as wide as possible, even up to three feet or more in diameter, and cut as much as two feet or more thick. Assuming you have to tools to cut this stump yourself, you can resurface your target when it needs it with another cut, until the whole is too thin to be useful. At this point, the search begins for another trunk. The big trouble with tree trunks is that they are not readily available everywhere, especially if they have to be three feet in diameter! I suppose one of the perks of becoming a better knife thrower is requiring a smaller target. Yet even two foot trunks are hard to come by in many places. After considerable experimentation, I invented the target to be described next. My goal was to construct something that would survive several months of throwing with heavy knives and axes, with a replacement cost at that time under $50. It was also to be as convenient as possible to disassemble and reassemble with new wood. A further goal was that there should be no metal inside of it for any knife point to strike. This ruled out nails or screws in its construction. I had experimented with 2 inch thick boards made from Douglas Fir. Fir is a medium wood, ideal for throwing almost anything. There are equivalents in most parts of the country. Two inches proved unsatisfactory. It withstood only the small to medium knives (up to 11 inches and 1/2 lb), and even those for only a few weeks of hard throwing. They were relatively easy to cut up and re-configure using a second board to mount on, but they broke up too quickly when I began to throw the bigger knives at them. There wasn't an easy way to hold these together side-by-side to make anything wider then 12 inches, not without nails or screws, etc. I found a lumber yard that had the same Fir in 4 inch thick and 12 inch wide beams. The good stuff was $5.00/foot, but they also stocked this stuff called "utility wood", or "header stock". It was cracked and otherwise unsuitable for any permanent use, but it was only $2.20 a foot. Three six foot beams cost me about $40. 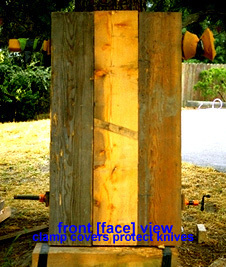 As I got better I shortened the beams to five and then four feet dropping the cost under $30. As you'll see, the cracks don't matter much in this application. The next acquizition was two pair of 3/4 inch pipe clamps, and two pieces of 3/4 inch pipe, threaded, about 42 inches long. The clamps and pipe were about $30. Lay the beams next to one another on flat ground. They should be laid so that their foot is a few inches from what ever it is the whole assembly is going to stand against. In my yard, there is a big strong tree to use. Consider also a large (6 or 8 inch) steel pipe set a few feet down in concrete. Use other boards or what ever you need to make the beams lay absolutely parallel to one another. There should be no places along the boundary between the beams where one is higher than another. If this can not be helped, move the beams so that the differences are greatest at one end or other, and not in the middle. 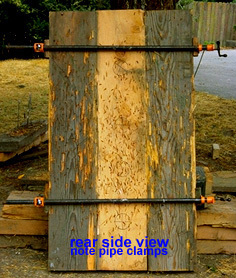 Put the pipe clamps on their pipes, and place each across the three beams about a foot or 18 inches from either end. I found it best to find four little blocks of wood 1/2 to 1 inch thick to use as pads between the beam and the actual metal of the pipe clamp. The clamp ends are only a couple of square inches in area; the wooden pads help to distribute the crushing force of the clamps. Now crank down on the clamps, enough even to slightly bow the 3/4 inch steel pipe. You want these beams to be held together very tightly. Once the clamps are set, go to the head end of the board and lift them all up against what ever it is that will hold them. If you build the holding pole, you might arrange for something of a pulley on top to assist with lifting the beam assembly. The full six foot target weighs about 200 pounds, but at four feet it weighs in at a more comfortable 130. Once it is stood up, take some heavy cord, nylon, or what ever sort of small rope, and tie it from one pipe end around the holder to the other pipe end. For saftey sake, tie both the top and bottom off, and make it strong enough that it won't just fall if hit from behind because the string breaks. Your target is now ready to be decorated (with targets) and used. This part is easy. You can use some dabs of common white glue to put up paper targets, or paint them on with brush, spray can, or other means. Most often I just draw them with my kid's crayons or a felt tip permanent marking pen. My six foot target had 3 targets on it, high, middle, and low. The four foot version has room for two, maybe three again when I get that good. When the boards get very chewed up, you turn them over. The center board will need to be turned and also replaced (one hopes) more often than the outer ones. I find as my throwing gets better that I turn the boards only once ever six weeks to two months, and that's with practicing every day. Once they are gone on both sides, you can cut them up and use them as fire wood. The biggest problem is that well chewed boards will loose their ability to stand against one another evenly when the pressure of the clamps is applied. As you try to lift the board and clamp assembly into place, the whole may fall appart because the clamps cause the used boards to bow inwards towards the pipe. This was a serious problem because it caused me to replace boards more often than should have been necessary. I finally found a solution in an inexpensive little device called a "corrugated nail". This is a small piece of corrugated steel sharpened on one edge. It is meant for joining together two flush pieces of wood like the corners of a picture frame. What you do is squeeze your frayed wood together from the front with pipe clamps, and connect the boards at the top and bottom (in the back of the target) with the corrugated nails. When they are so connected, remove the pipe clamps from the front and put them back on the back to add some extra support. Now lift the target into place. In an experiment with some very frayed wood, the corrugated nails held the target in place long after I would otherwise have had to discard the beams, although the boards did tend to split near their edges after a while leaving the nails holding nothing at all. The solution turned out to be duct tape. I had tried duct tape alone on frayed boards, and while it helped, it would streatch eventually, and the boards would begin to slip forwards and backwards. As it turns out, a combination of duct tape and corrugated nails is ideal! The duct tape prevents the wood from splitting around the nails, and the nails prevent the wood from sliding back and forth! The target described here is of my own design. Knife throwers have been inventing creative target solutions for a long time. Other designs can be found in books by Gil Hibben, Harry McEvoy, Blackie Collins, and others.